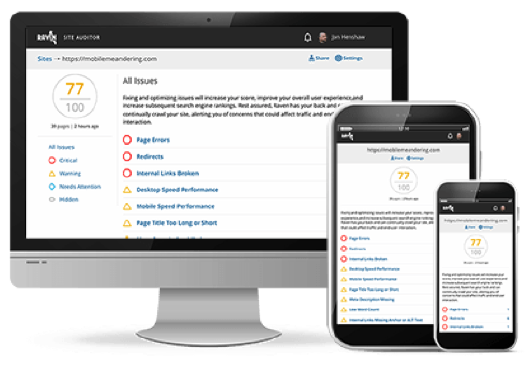 Diagnose website issues and improve visibility to your site. Website audits are a necessary part of online business. Without a website audit, you risk losing visiblity on organic searches and you wind up spinning your wheels as you work to get seen. 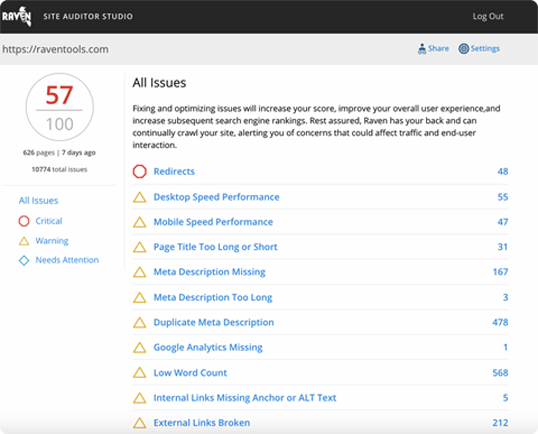 But - are all website audit tools created equal? Before you choose to invest in a site auditor, it’s important to identify what is important to you and your team. The Raven Tools Website Auditor categorizes all issues into 6 primary buckets in the default view. Here, you will find a listing of the pages on your website and information on which pages may not be visible to users or search engines. Visibility issues refer to problems that affect how Google crawls your site, so this includes server errors, 404’s, redirect issues, robots.txt issues, or malware issues. Your website’s meta data is a key part in how your site is found by search engines. This includes things like: is Google Analytics installed? 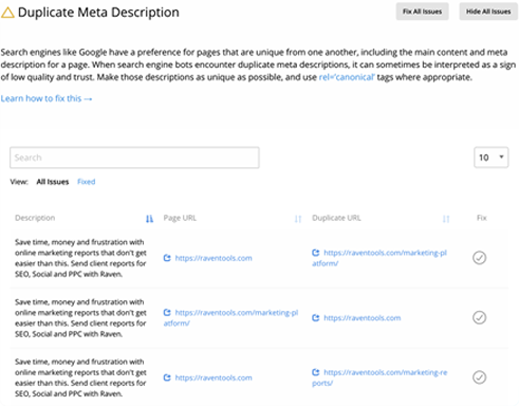 Do you have duplicate meta descriptions or page titles, are you missing meta descriptions, do you have a page title that is too long or too short? The content on your website is important for bringing in traffic, selling your products and services, and converting visitors into customers. This part of the website audit will identify duplicate content or low word count. External and internal links are vital to your site’s SEO. Internal links help search engines understand how your site is organized, while external links show search engines that your business doesn’t exist on its own island. You’ve done your research, you know your industry and your customers, and you’re pointing them to further resources on your topic. Your website needs to be more than just words, and the images that you use should be relevant to your website, load easily, and enhance the user experience. 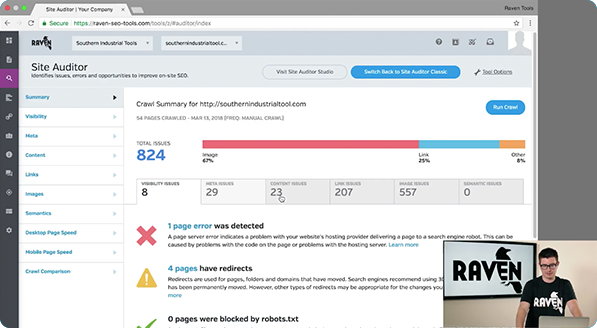 After analyzing billions upon billions of site issues, images remain the most occuring problem for websites found in our audits. In Images, identify title text issues, broken images, and alt text issues. The way your website is organized, both at the page level and within each page, helps search engines link your website up with relevant user searches. Semantic Issues are more important than ever for 2019 SEO. This part of the website auditor identifies header issues and schema issues (micro data). SEO in 2019 has brought an emphasis on site speed as a page specific ranking factor. Mobile First Indexing has also been rolled out, which means that you'll need to prioritize mobile issues for your website. 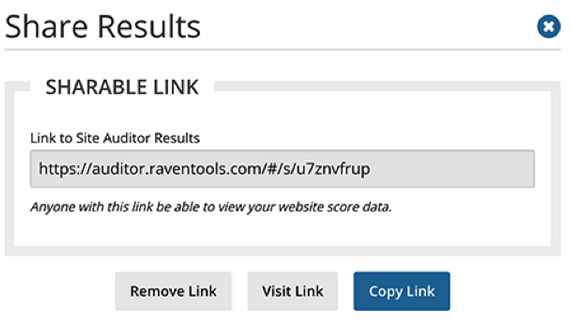 The Raven Tools Website Audit will give you specific tips for increasing your page speed and optimizing for mobile. Raven Tools offers two ways to view your audit. The classic, which shows the primary buckets with the side bar, or the studio, which is the view you’ll want to use when sharing results, or when you want to create a checklist that can be marked off as you continue to optimize your website. With Raven Tools, not only do you get a listing of the problems that may be holding your website back from better performance, but you also get an actionable, easy-to-follow checklist of suggestions that can make your website better. Keeping your website up-to-date and in solid competition with other businesses in your space doesn’t have to be difficult. With Raven Tools, you can get it done in minutes with just the click of a button. It’s hard to keep organized with website fixes, so why not use an audit tool that optimizes your ability to stay organized? It’s important to track your progress to show SEO successes. While clients normally desire to see Rank tracking and Conversion numbers, its still necessary to show them that a critical aspect of their SEO campaign is moving towards completion. 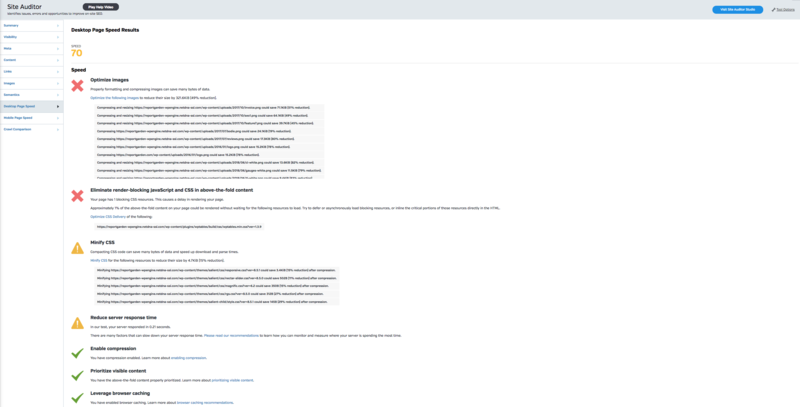 The website auditor integrates directly into our marketing report tool, so you can customize any KPI you’d like to see and demonstrate in a bite size report the number of issues for a site along with the issue trend to see if things are improving. Its important to share your SEO roadmap with your clients and your team, so we’ve included a very simple share button that allows you to share with anyone on any device. Websites aren’t just “set-it-and-forget it”. They need to be ever-evolving assets to your business – growing and changing as your business goals, marketing strategies, and technologies change. Do you often forget to run an audit on your website, only to find out months later that a plugin was broken or you’ve got pages set to not be crawled by search engines? That’s possibly thousands of visits and potential customers you may have lost! A regular website audit is an important habit to create. With Raven Tools, schedule your site to be analyzed weekly or monthly. We'll monitor and alert you when we find new problems or optimization opportunities. Choose your schedule. Choose your crawl depth from 1 - 10,000 pages. Block pages from being crawled by setting exclusions. Site Auditor works on phones, tablets and PCs. Analyze sites on the fly and get results no matter where you are. Try analyzing your site now! 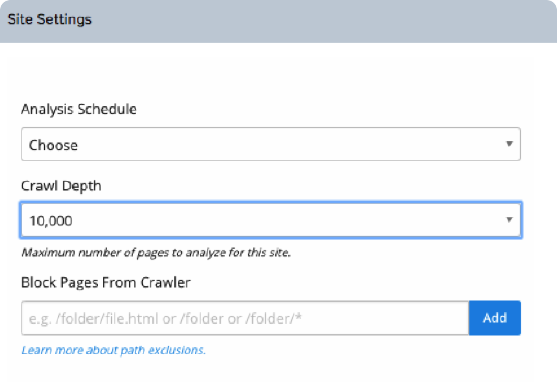 Crawl & Analyze My Site Now!